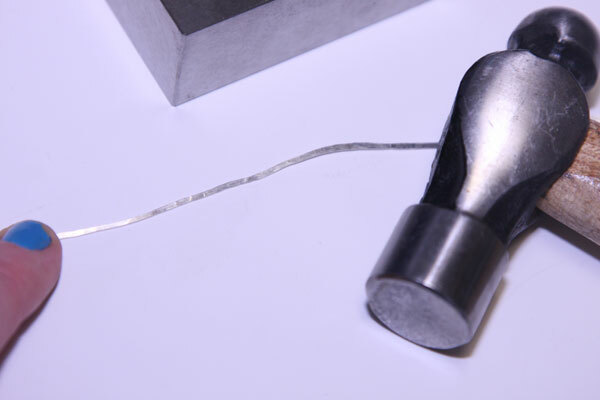 *silvertone round wire (in a thick gauge; the thicker the better)…or you can use square wire or rectangular wire and skip the hammering part if you like. 1. Trace around the arrowhead onto the embossing metal. Add about 1/2″ or so, and cut out the metal piece. This will become the top half of the ring. 2. 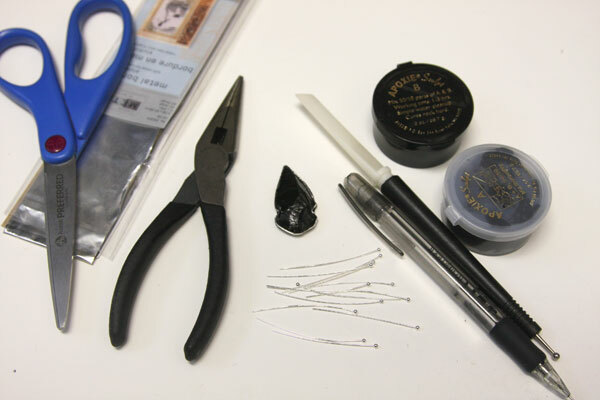 Take your wire, and loosely wrap it around the circumference of the arrowhead to guesstimate how much you will need. 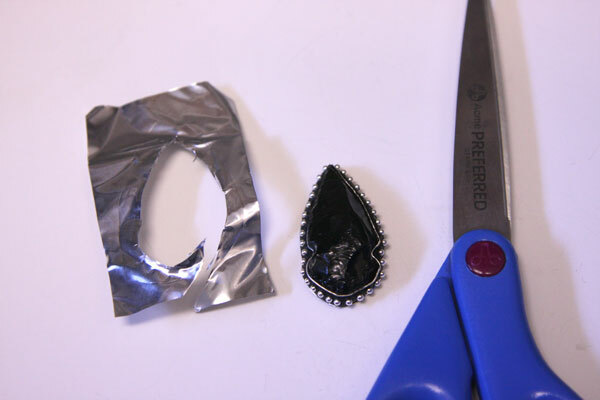 Cut, and pull your wire through a folded-over cloth a few times to straighten all the kinks out of it. 3. Using a hammer, pound your wire flat on a flat, strong, even surface (like the concrete floor in a garage). I’m using a ball-peen hammer (you can just use a regular hammer; it doesn’t matter), but I also have a jeweler’s steel bench block – which is perfect for this as hammering the wire on top of this imparts a bright sheen to it. Use what you can! As you can see I didn’t straighten out the wire enough before I hammered it. 4. 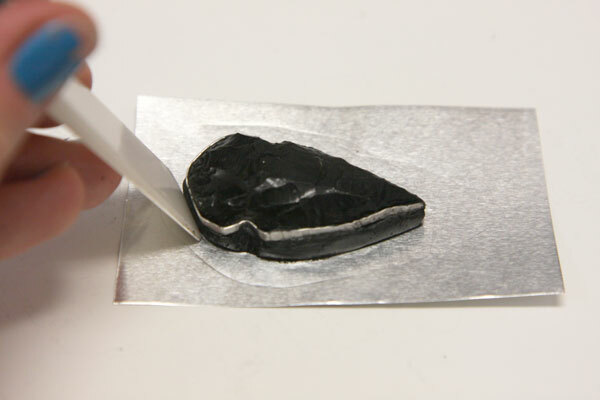 Now wrap the arrowhead tightly with the wire, all the way around. 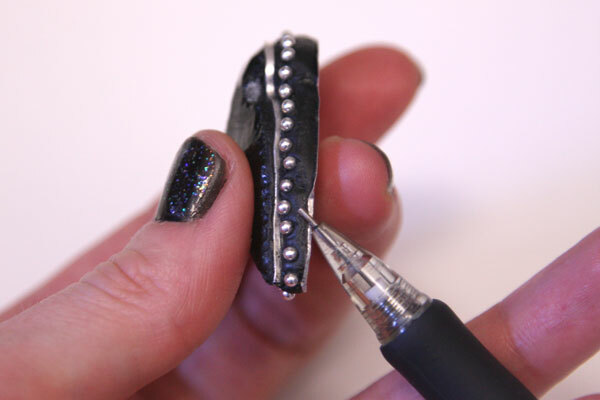 Use the pliers to push the wire into the nooks and crannies of the arrowhead; this is creating a faux-bezel. I took this photo after I mixed up the Apoxie. 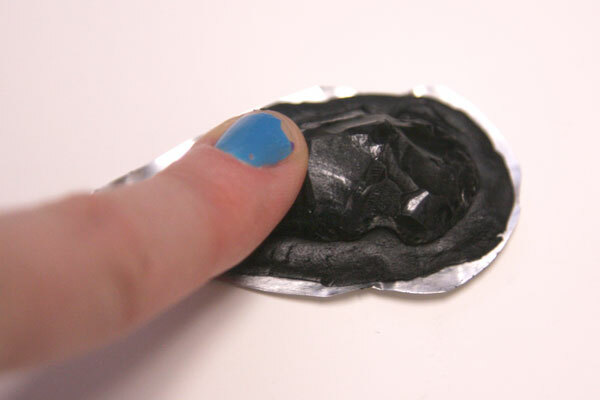 Interestingly, though it is nontoxic, the molding compound eats away at nailpolish. Just an FYI! 5. 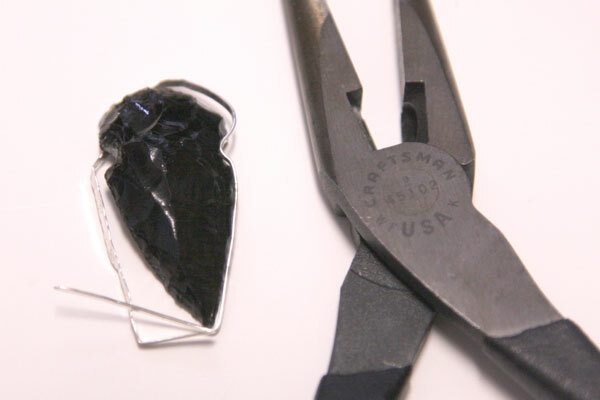 Cut the wire flush at the tip of the arrowhead. 6. 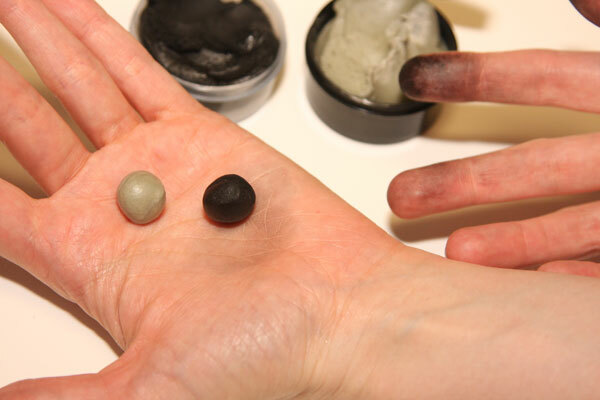 Mix up a ball of the Apoxie Sculpt according to the directions. (In retrospect, I should have used a pair of latex gloves to do this…it’s extremely messy.) 7. Flatten the ball onto the embossing metal piece you cut out in Step 1). 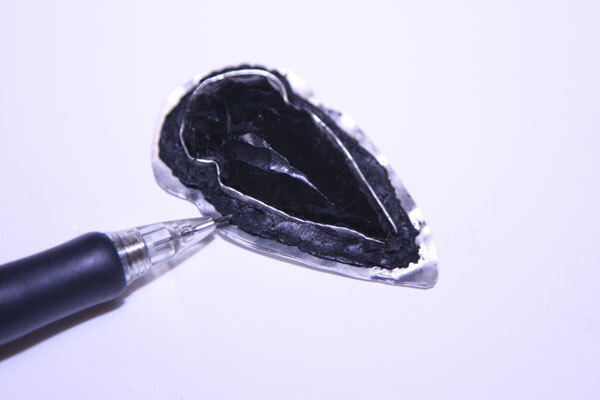 Push the arrowhead down into it so it is “sunk into” the Apoxie Sculpt. 8. Add the wire, and use the mechanical pencil tip (with the pencil part retracted; or use another thin metal instrument instead) to push down the molding compound around the bezel. 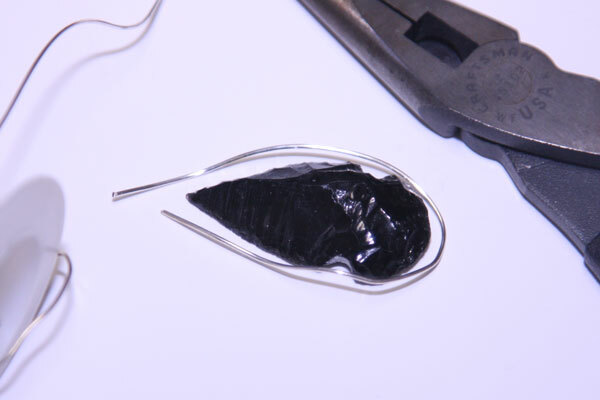 Also use the tip to “cut away” the excess compound from around the bezel, leaving the thinnest of layers holding that flattened wire around the arrowhead. 9. Tape the ends of the wire together into the Apoxie Sculpt so they don’t stretch out, and leave to dry about 24+ hours. 10. Now that the top part of the ring is dry, cut away the excess embossing metal all the way around, as close to the hardened Apoxie Sculpt as you can. 11. 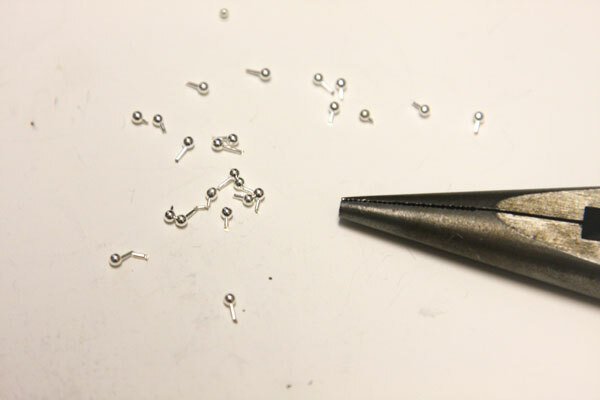 Use your wire-cutting pliers to trim the ends off the headpins as close to the ball-ends as you can get. 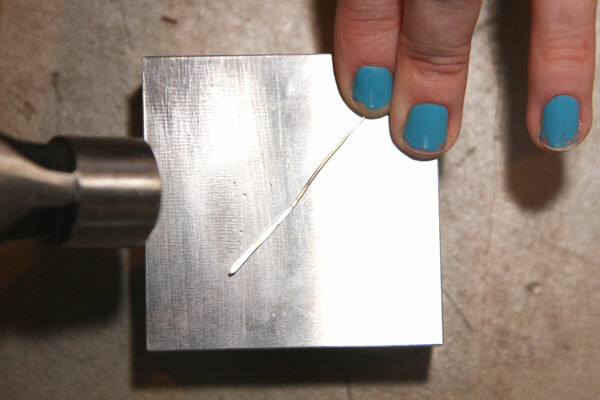 You just need a little bit of the headpin left. 12. Mix up another small ball of Apoxie Sculpt. This time, press it onto the back of the top part of the ring. 13. Then press everything onto a new piece of embossing metal. Push down so the molding compound swells around the edges of the top part of the ring. Use a flat plastic tool (like a butter knife) to smooth the edges of the molding compound. 14. 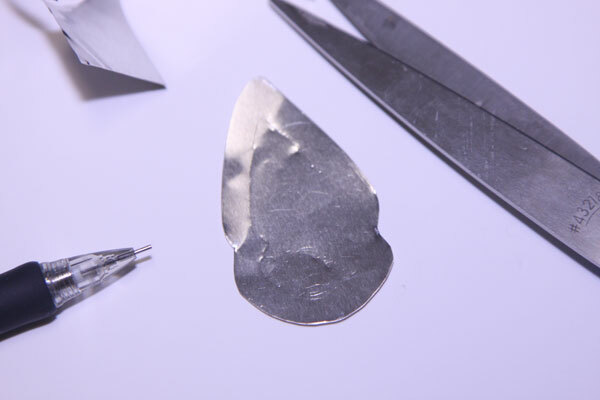 Start pushing the trimmed headpins into the soft Apoxie Sculpt layer, going all the way around the arrowhead. Just push in far enough so the ball-end is slightly sunk into the molding compound. 15. Allow to dry about 24+ hours. 16. 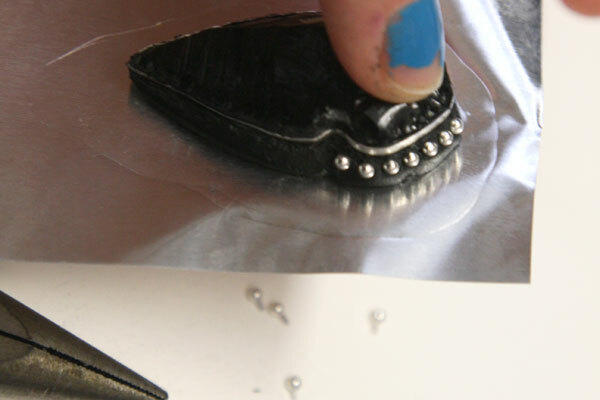 After everything is completely dry (the Apoxie will be rock-hard), cut away the excess embossing metal at the bottom. 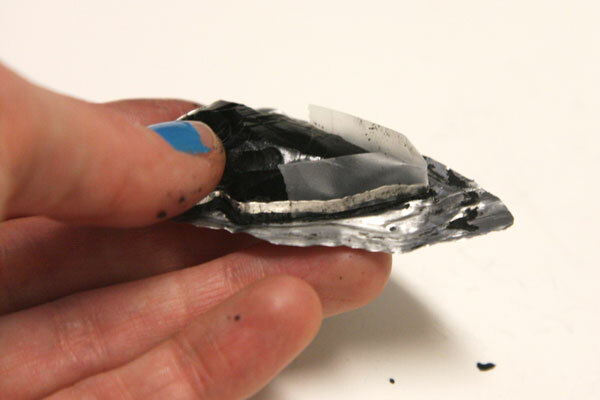 Leave about 1/16″ of metal around the edge. 17. 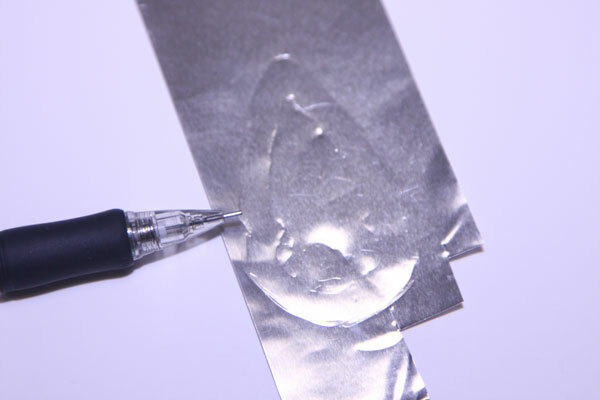 Use the mechanical pencil to smooth the embossing metal up and over the edge of the solid molding compound. This creates a faux bezel around the whole piece. 18. 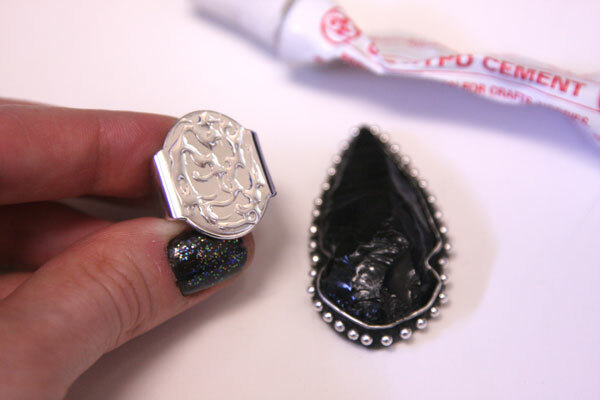 Spread Hypo Cement onto the top of your ring shank, and glue the arrowhead piece onto it. Allow time to dry (taping it together will help secure the bond). Et voila! 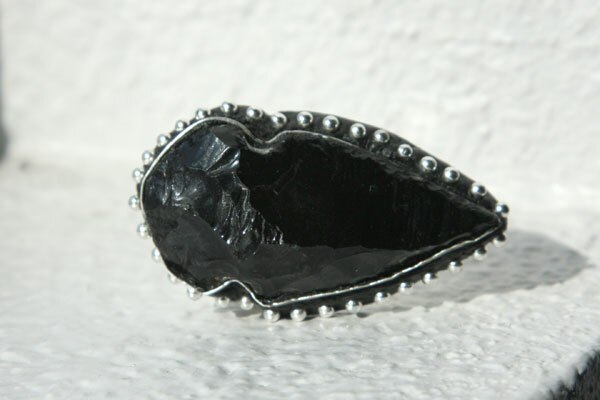 A rugged statement ring to sport on your finger – that gives off a Boho vibe or the je ne sais quoi of downtown cool depending on how you style it. **What is Apoxie Sculpt? Well, it’s a lot like PolyClay, except it’s a two-part mixture, that mixes to a putty-like texture and air-dries slowly over a 24-hour period. 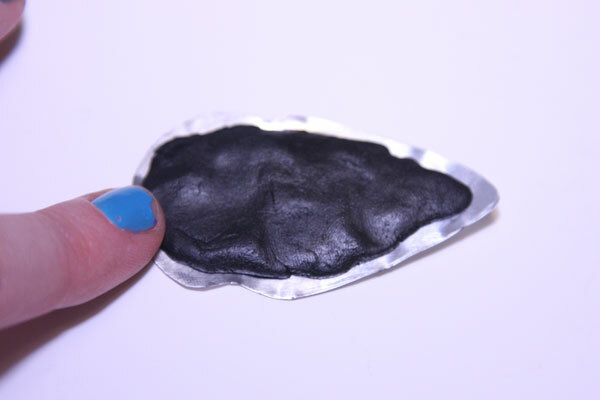 It is non-toxic, and unlike PolyClay you don’t have to bake it in the oven (which means no harmful fumes in your oven, and you can use it with metal or stones or just about anything you can think of!). It comes in a variety of colors, and after setting is ROCK-hard, and doesn’t shrink away from metal (like Japanese air-dry resin clay does, I’ve found). 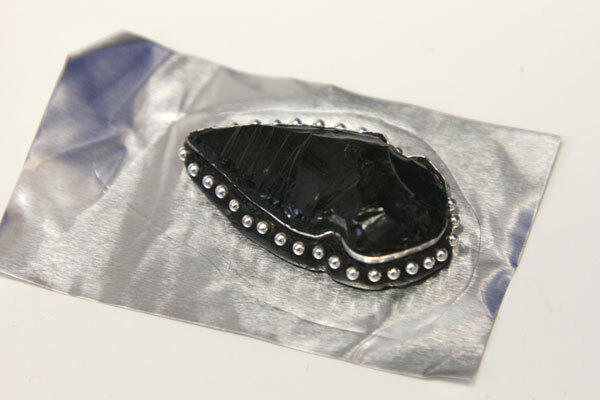 It’s soooo easy to use, and there are hundreds of creative ways to use it, from setting stones to creating faux-pave, to faux enamel-work to using in place of adhesives (once cured, it’s much stronger than any adhesive on the market! )…for someone incapable of soldering like myself, my mind is spinning entertaining all the possibilities! 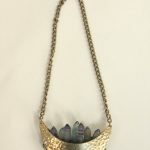 Get it exclusively at FireMountainGems.com. 2 words – You’re awesome! Natalie Hua recently posted…Kim &amp Kris Birthday giveaway! Wow that turned out amazing! You are soo creative and so good at DIY’ing. I love this, but it seems like it would take a good amount of time, and I am such a procrastinator with stuff that takes a good amount of time haha, so I am not sure if I would try to make this myself. Very, very impressive. I tip my head just for figuring out how to do it! I can’t believe how much work you put into this! Amazing, absolutely stunning DIY project. I am quite an expert myself, but this looks highly “DIY-geeky” to me! Well done and thanks so much for sharing. This is so clever! I had never heard of half the materials you have used – thanks for sharing your knowledge and cleverness with us! No problem Angela!! 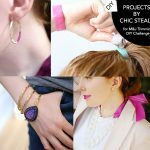 :-) I’m probably not using everything exactly how they were *meant* to be used originally, but the fun of DIY is re-purposing and re-invention, right?!! This is a dead ringer for the insanely-priced original piece! If I were to see someone on the street wearing your version, I would never guess that it was DIYed. Random question, but does Hypo Cement work on plastic as well? If so, where do you buy it? Hey Sara- Thanks for your kind words! On my version the ball-pins are rounded, whereas the real version they’re hammered flat and a little smaller, spaced closer together – but I think that’s the only visible difference!! (And the silver bezel is thicker…okay, that too.) Sorry I forgot to include the link to the Hypo Cement; fixed now. The website where it’s sold says it’s for non-porous materials (thus, metal and glass; plastic is too porous to be used with this). It’s very similar to Crazy Glue in that it’s a cryanoacrilate that dries to a brittle finish, but is a little more viscous while wet. 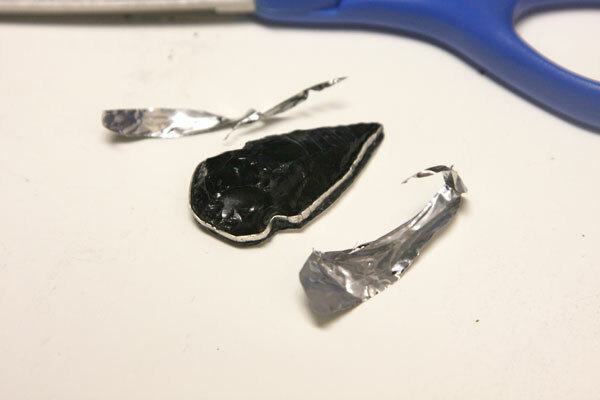 If you’re gluing mixed materials (like plastic to metal, for instance), and the seam is *not* going to undergo stress, probably good ol’ E6000 or another flexible glue will work. Oh! I really like Loctite Vinyl, Fabric, and Plastic glue. That is super-duper, even better than E6000. 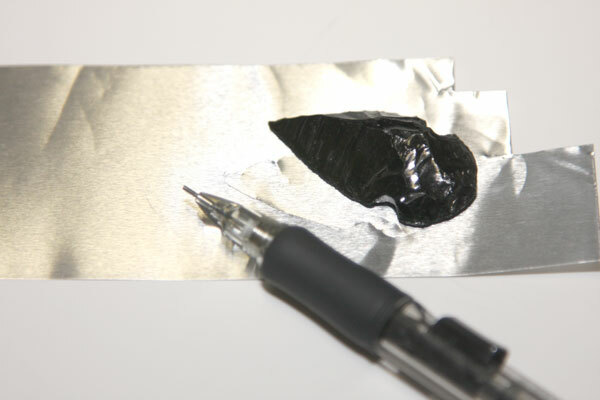 But if it’s a stress-bearing seam, definitely go with a 2-part epoxy for the strongest seal. Hope that helps! Carly, I am so impressed! Amazing work… very inspired. Enjoy your ring, you sure deserve it! Carly, this is incredible! 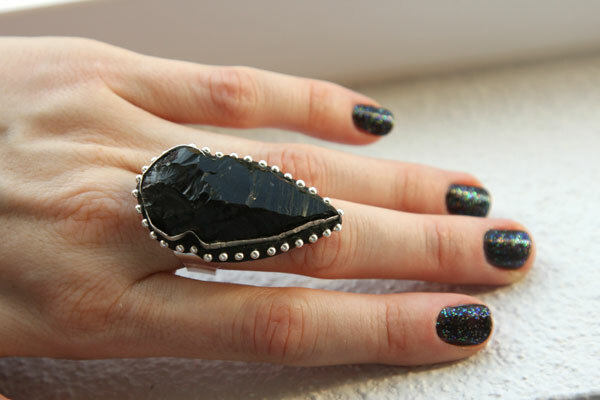 You’ve done a fantastic job, this ring is to die for! Hey Carly, I LOVE your version of the ring. I do have a quick question though: do you think that the 2 part apoxy you used could be used to make ring bases? i have a large ring size (13) and don’t really like adjustable bases. I’m worried that if I used it for that then it would expand/shrink and not fit, not be sturdy enough to actually wear, etc. Maybe if I wrapped apoxy around an adjustable ring base when it’s stretched to my ring size? any ideas? Thanks! I’m definitely gonna try this after finals are over! Hi Annette! Glad you liked the tute!! :-D Although Apoxie Sculpt can be sanded and shaped once cured, I’m not sure it would work as a ring base on its own. I think you could certainly wrap it over a metal base and allow it to dry and make your ring that way. 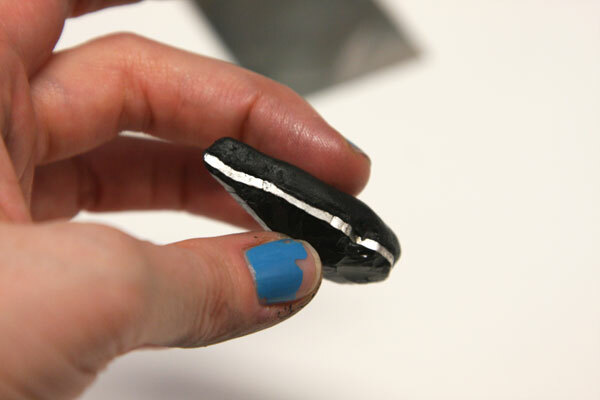 The molding compound is waaay too soft to make a ring shape and then just leave it alone to dry; it has to have something to form it around or else it will collapse/crack, and unfortunately it’s super-sticky so whatever you form it around will probably get bonded permanently to it. 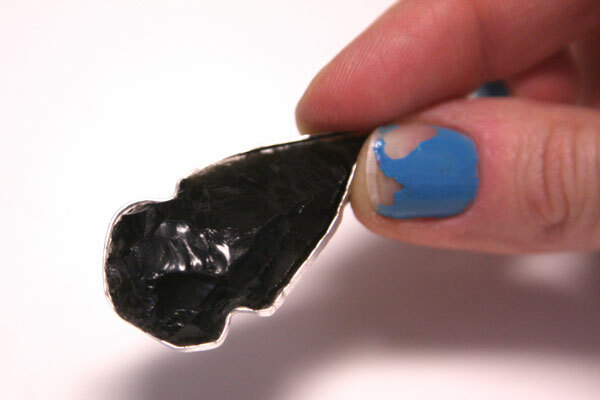 Even though it’s extremely strong when dried I would be worried about it being too brittle on its own to be a ring shank. You might have to experiment with it a little! 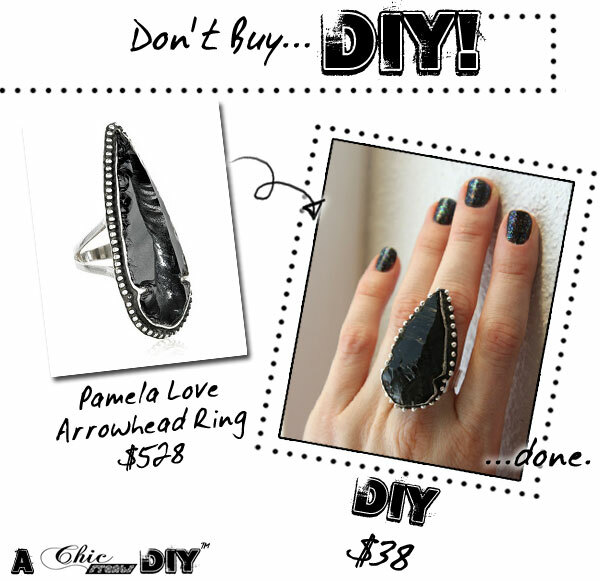 Wow, this is definitely one of your better “Don’t Buy:DIY”s (and all of them are so good!). It looks really authentic and nice! Such an amazing DIY, can I ask what thickness the wire was that you used? This is, in all honesty, incredible. 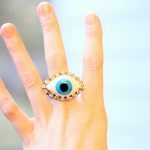 I have been dying to get the Pamela Love ring and I was going to but when I came across your website, I was inspired to do it myself. Whoever, I do not know where I could find a ring shank? Could you tell me where you found yours? Kudos to your talent and creativity! Carly, this is AMAZINGGGGG!!! I would love to try to make this. What size/ thickness was the wire that you used? or what size would you recommend? Thanks a million. Thanks Monica! I think the wire I used was 16 ga; it was just the cheap, thick wire-wrapping wire sold at Michael’s. I think it was an aluminum-core. Really, the thicker the better; after smashing it flat it looks like pricey sterling bezel. Just make sure to straighten it before flattening it!! Good luck! This is so awesome. I am totally inspired to try this out…ordering apoxie sculpt now!! Thanks for sharing, can’t wait to see what else you come up with! Aw, thanks! Hope you like it and have fun working with it…it’s a bit sticky but so awesome! I had never heard of half the materials you have used – thanks for sharing your knowledge and cleverness with us! Carly, I am so impressed! 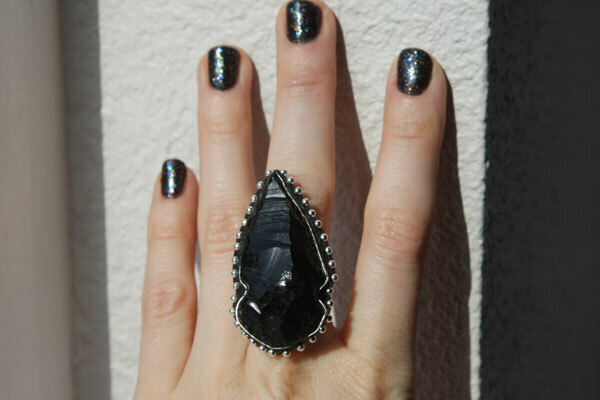 I actually have the Pamela Love Obsidian ring, and now after seeing this I wish I never bought it! Its amazing how you did that, I would love to make one, but obviously not another ring. Do you think this would work making a bracelet or necklace? Any tips? I don’t think I’ve ever left a comment on a blog or a tute before, but I was just floored by this! Stunning work! So what are your thoughts? And thanks again for such a perfect tutorial! Hi Mina! Thanks so much for your kind words:-) In answer to your question, the ring has held up pretty well with wear. (But I don’t wear it every day; just once in awhile.) 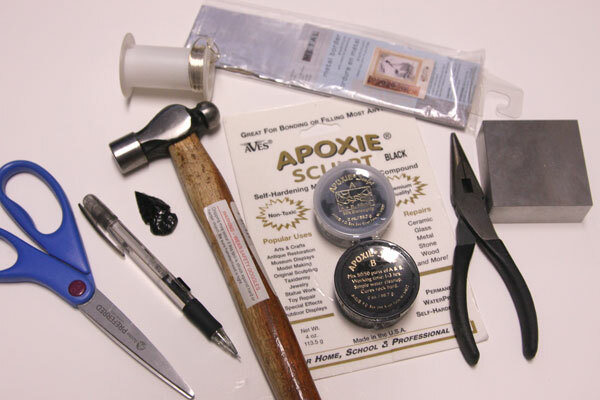 The Apoxie Sculpt hardens to ROCK-hard and doesn’t chip or crack after setting. The only problem that I could foresee is the glue you use to attach the ring to its base…I used E6000 in the tutorial, but I’ve had problems with it before. It’s really more of a “hobby” glue and isn’t industrial strength…I’m actually able to rip two parts that have been glued together using this back apart, even weeks after it sets! Though my ring has remained intact (and I’ve been v. careful), in hindsight I’d recommend a stronger glue for gluing to the ring base, like a 2-part epoxy (Devcon), or using more Apoxie Sculpt. You can actually find Apoxie Sculpt (well, something similar to it) at Michael’s stores now, in the section with the leatherworking and bags of rhinestones (or at least that’s where it is in my local Michael’s);-) But it is a bit of an investment…I use it frequently so it works out for me, but if you’re buying it to only use once, on this one piece, it may not be worth it for you.